A Realm of Mysterious Entities. Announcement Welcome to Woodland Shrine! Thank you so much for visiting my shop! I also have a booth at the Portland Saturday Market most weekends from March through Christmas. Follow our Instagram @woodland_shrine for updates and upcoming products! Everything that we offer at Woodland Shrine has been handmade using recycled and scavenged materials. All animal bones and feathers have been found, cleaned and processed here at the homestead. If you have any questions or concerns, please don't hesitate to send a message. I check them every day and will get back to you within 24 hours. 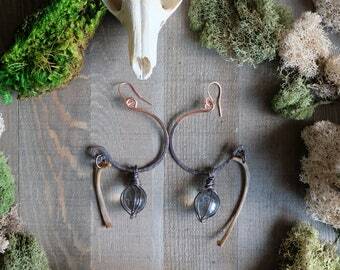 Black oxidized copper woven hoop ear hangers with deer bone fragment ladders. Love them. But then I like most of your work. 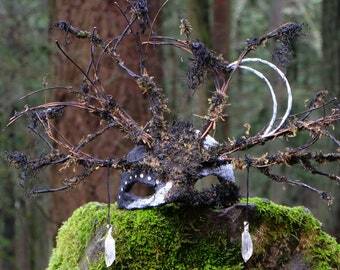 Magical masks created for magical creatures. 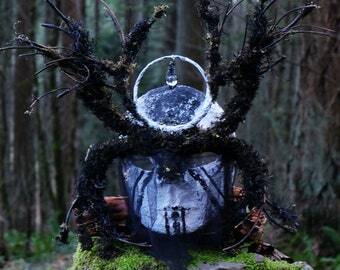 These masks and jewelry are a representation of the natural world that is around us. Find WoodlandShrine at the following upcoming market! Can you remake a mask or crown that has already sold? No! Everything we make is one-of-a-kind. Also, due to the nature of what I make, it would be very difficult to come across some of the materials more than once. But I do accept custom orders and would love to make something unique just for you! Do you accept custom mask orders? Yes! I would love to collaborate with you to make you something that you really love. But keep in mind that I may not always have certain pieces of nature available since I scavenge everything. All custom mask orders require a $50.00 down payment before I can get started and the turn around time is usually 3 to 8 weeks depending on my schedule. If you would like to place a custom order, just shoot me a message! 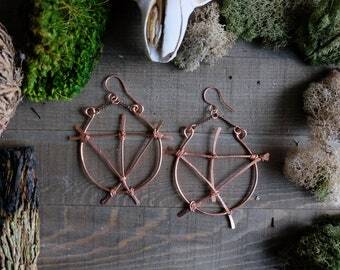 Do you accept custom jewelry orders? Can I send you materials to make me something? 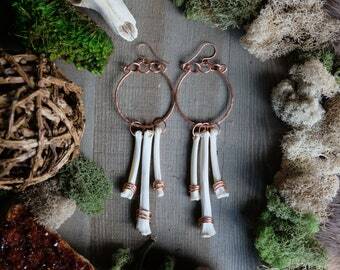 Can you put (insert here) animal bones in my custom piece? I would love to make you a custom jewelry piece! If you have materials that you would like me to include, that is wonderful and I would love to make you something special out of it! As for remaking a past piece, I very rarely make anything exactly the same and it depends on what materials I have available. Most of what I use is recycled or found and I don't usually have the same thing twice. If you want to me use specific animal bones, it really depends on what I have since I only use what I can find when I scavenged. If you already have certain bones, send them on over and I can make you something nice! However, I refuse to work with illegal or unethical bones for obvious reasons. Why do your masks take so long to make? I am a one-woman-show and all of my masks are made entirely from scratch. The mask shell itself can take 2-3 weeks to dry before I can even get started on painting and decorating. Do you use actual faces for you masks? Can you use mine? No. Due to the nature of the process that I use, it would be next to impossible for me to capture you face like they do with plaster molds. Each mask is made from a very basic positive mold and I sculpt each face individually without references so that each face is unique! How do I care for my mask/crown? Mask and crown care is relatively easy. Every bit of nature is preserved and you do not have to worry about it browning, rotting, drying out, dying, etc. Since the mask is essentially paper mache, don't put it in an overly moist environment, such as the bathroom, and keep it inside. But other than that, the masks are quite durable and can handle most environments.